Some of the components that make up the receiver are variable. Of these, some are used for tuning and volume adjustment and are variable at the will of the operator. Other components can be varied only with the help of special tools and special test equipment. The variable components of the IF tuned circuits belong to the latter classification. Their adjustment to satisfactory working conditions is called alignment. Alignment also includes setting the ganged-tuned circuits of both the HFO and the RF stages so that they track always at the correct frequency difference required for the IF tuned circuits. Alignment is difficult and time consuming. Undertake it only when necessary usually after major repairs, or when troubleshooting or performance testing indicates a need for alignment. The actual procedure of alignment differs from receiver to receiver. Follow the TO procedure whenever possible. However, you can adapt the procedure described in the following paragraphs to most receivers if a more specific procedure is not available. Alignment setup. You can see the setup for an alignment procedure in the schematic diagram on page 167 for a superheterodyne receiver. Note that the tuning indicator is an output meter connected across the secondary of the output transformer. A signal generator (shown in three different positions) provides a test signal which, in turn, provides an output indication. Each stage is tuned for a maximum indication on the output meter. The position of the signal generator depends on how difficult it is to get the test signal through to the output meter. If the receiver alignment is not too far below standard, the signal generator may precede all the stages to be tuned. If the alignment is very bad, it may be necessary to connect the signal generator directly before the stage to be aligned to make sure that the test signal can get through the stage. Alignment begins with the tunable stage closest to the output meter, and then moves stage by stage in the direction of the antenna until alignment is completed. The signal gen erator also moves stage-by-stage in the direction of the antenna. The signal generator supplies a test signal at the IF frequency when it is connected to the grid of one of the IF amplifier tubes. When it is connected to the grid of an RF amplifier, the signal generator supplies an RF signal within the tuning range of the receiver. When the stages have been tuned in order, each stage is given a touchup retuning for greater accuracy. Handling the avc in alignment. The AVC of a communications receiver makes tuning more difficult, because it cuts down and broadens the response of the tuning indicator. To overcome this disadvantage, perform the alignment with as weak a test signal as possible, or disconnect the AVC circuit. The AVC has least effect when the signal is weak. To take advantage of a weak signal, set the receiver volume control at maximum. Then regulate the signal generator so that the response is about half scale on the most sensitive range of the output meter. As tuning progresses and the response increases in amplitude, keep reducing the signal generator output so that the response continues to read about half scale on the output meter. The other solution is to disconnect the AVC. Many receivers have a switch for disconnecting the AVC. Otherwise, you can disable the AVC circuit by disconnecting the AVC lead at the diode detector load resistor. Often, when the AVC is disconnected, you must supply a fixed bias. The bias voltage can be introduced through the disconnected AVC lead. Output indicator positions. In alignment, the output indicator can be connected across the secondary of the output transformer between the plate of the second audio amplifier and ground, or across the plate load resistors of the diode detector. Since such connections put a DC potential on the output indicator, make the connection through a coupling capacitor. Of course, if the indicator has such a capacitor in its circuit, the connection may be direct. Test Setup aligning such a receiver, first tune the circuits with the crystal switched out of the circuit. Then, touch up the tuning with the crystal switched into the circuit and the signal generator supplying a test signal at the exact frequency of the crystal. Alignment of wide band receivers. 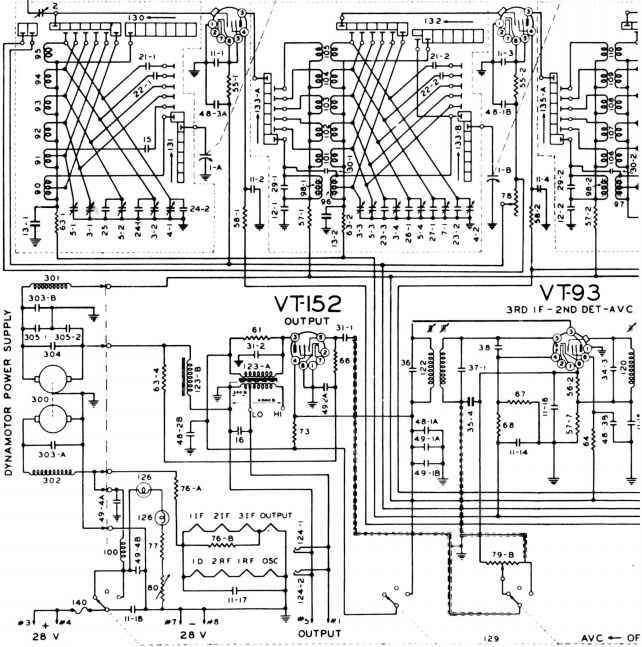 FM, SSB, and television receivers require special treatment because they have special circuit arrangements to provide a wide IF bandpass. On these receivers it is usually necessary to tune each stage in the IF section to a different test frequency. You will find the frequency to be used at each stage in the proper TO. Output indicators for alignment. Many receivers contain meters or metering circuits which can be used in alignment. With those that do not, you can use a voltmeter, a vacuum tube voltmeter, or an oscilloscope as an output indicator. When you use an oscilloscope as an output indicator, connect the receiver output to the vertical deflection plates.